Why 'one more book' on pediatrics? Over the last 2 decades, medical information for the undergraduates has exponentially increased. All specialties have seen a mind-blowing increase in content and knowledge. The young medico is inundated with overwhelming information. What is important and what is not? What is needed for clinical management? Many students find it a challenge to understand English. This book, tries to bridge the gap between concepts and understanding using simple language, attractive cartoons and a colorful layout. It focusses on helping the young student to understand the "why and how?" An added attraction is the history panel at the top of every chapter. It provides interesting facts about those who innovated and discovered major milestones in medical history. 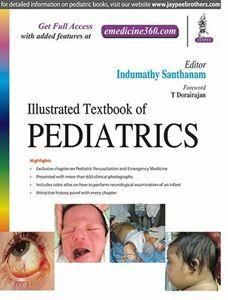 The first book to include a chapter on Pediatric Resuscitation and Emergency Medicine. A color atlas on how to perform neurological examination of an infant. More than 650 clinical photographs. An attempt has been made towards learning pediatrics a passion.